TMA has organized a workshop on the right diet, self defence demo, quiz program and zumba dance for w o m e n ' s a t t h e p r o g r a m “ASSERTIONS” - an eve to celebrate th womanhood held on 7 March 2018 at Chamber Hall, Trivandrum, in connection with International Women's Day, was followed by TMA –ALIVE Women Entrepreneurs Award 2018 . 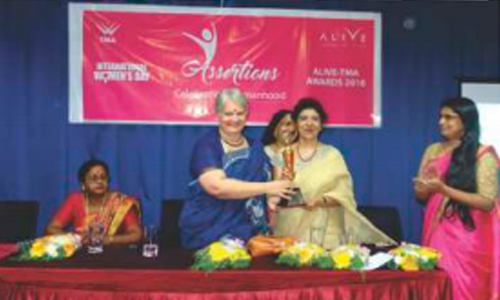 Three senior women entrepreneurs above 60 in the Trivandrum city were honored with the TMA women entrepreneurship Award jointly instituted by the TMA and Alive. Smt. Sobha koshy, Former, Chairper son, Kerala S tate Commission for Protection of Child Rights presented the awards to Dr. Santhamma Mathew, Managing Director, Credence Hospital, Ulloor, Smt. Saraswathy M. Nair, Owner, Saras Driving School, Ambalamukku and Dr. K.G. Vijayalekshmi, Chairperson, Sandeepani School, Palayam and the women's day program was well received b the participants. Smt. 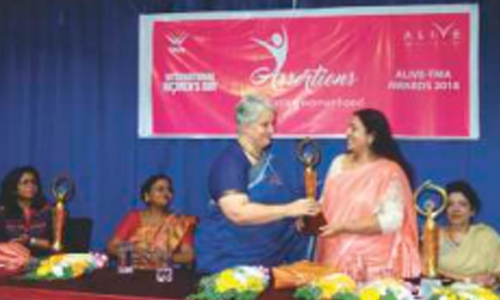 Sobha koshy, Former, Chairperson, Kerala State Commission for Protection of Child Rights presenting the TMA-ALIVE Women Entrepreneur Award to Dr. Santhamma Mathew, Managing Director, Credence Hospital, Ulloor, Trivandrum. Smt. 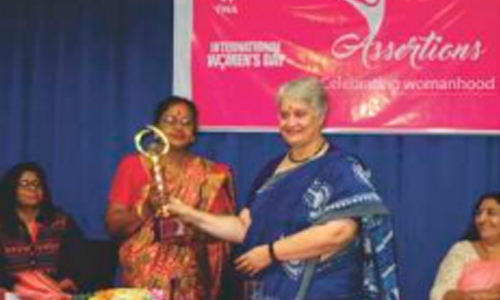 Sobha koshy, Former, Chairperson, Kerala State Commission for Protection of Child Rights presenting the TMA-ALIVE Women Entrepreneur Award to Smt. Saraswathy M. Nair, Owner, Saras Driving School, Ambalamukku, Trivandrum. Smt. Sobha koshy, Former, Chairperson, Kerala State Commission for Protection of Child Rights presenting the TMA-ALIVE Women Entrepreneur Award to Dr. K.G. Vijayalekshmi, Chairperson, Sandeepani School, Palayam, Trivandrum.